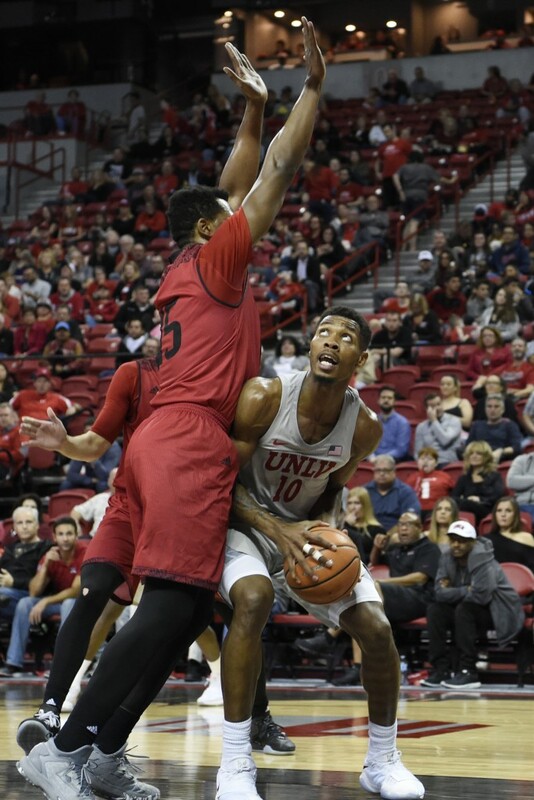 It remains to be seen whether Saturday night’s 88-78 victory over San Diego State at the Thomas & Mack Center could be the highlight of a so-far disappointing Mountain West season for the UNLV Runnin’ Rebels. But barring a win over Nevada, it will be tough to beat. The Runnin’ Rebels snapped an 11-game losing streak against the Aztecs, including seven in a row at the Thomas & Mack, ending the game with an impressive 11-3 run and holding the Aztecs to just one field goal over the final 4½ minutes. Considering recent past history, it’s hard to decide what was more impressive for Marvin Menzies squad: the fact the Runnin’ Rebels scored a conference-best 88 points while shooting 59 percent from the floor, or the fact UNLV was the tougher team on the court. Normally, the Runnin’ Rebels are lucky to score 88 points in TWO games against the tough and tenacious defense of the Aztecs. Usually San Diego State is the one who punks UNLV. But this time it was the Rebels who did the punking, carving up San Diego State inside and finishing with a huge 48-30 edge in points in the paint. Shakur Juiston and Brandon McCoy led the way with 21 points apiece while point guard Jordan Johnson added 14 points, four assists and two steals. McCoy, who was 9-of-12 from the floor, started the game-ending run with a 15-foot jumper and Juiston added a pair of mid-range jumpers. UNLV (15-6, 4-4 MW), which also snapped a three-game home losing streak with the victory, moved back to .500 in Mountain West play with the victory and into a tie for sixth place with Utah State (12-11, 5-5). With woeful San Jose State (3-17, 0-9) on deck, the Runnin’ Rebels should finish the first half of conference play with a winning record. KEY PLAYER: Junior forward Shakur Juiston put up an eye-popping stat line, tying Brandon McCoy with a game-high 21 points on 10-of-13 shooting, grabbing a game-high 11 rebounds, dishing off five assists which tied Jovan Mooring for game-high honors, and collecting a game-high four steals. Not bad. It was the ninth double-double of the season for Juiston. – UNLV forward Shakur Juiston on snapping an 11-game losing streak to San Diego State. – San Diego State coach Brian Dutcher, according to the San Diego Union-Tribune, to his team after Saturday’s night’s loss. UP NEXT: The Runnin’ Rebels host San Jose State on Wednesday night at 8 p.m. The contest will be televised by AT&T SportsNet. NOTABLE: San Diego State lost senior guard Trey Kell to a sprained left ankle at the 16:37 mark of the first half and UNLV already ahead 9-2. Kell came into the contest averaging 10.8 points and 4.1 rebounds per game. … The Rebels won despite shooting just 59.3 percent (16-of-27) from the free throw line. … San Diego State finished with 18 offensive rebounds and a 19-10 edge in second chance points. … UNLV averaged just 55.5 points and shot an average of 37.5 percent from the field in the 11-game losing streak to the Aztecs.